You may recall the case of the shoeless beggar found on a New York City street this past November by a NYPD officer. 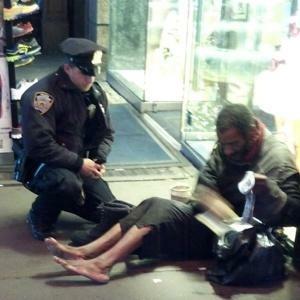 A passerby photographed NYPD Officer Lawrence DePrimo kneeling beside the man on a cold November night in Times Square, giving him a pair of boots. The photo, shot by tourist Jennifer Foster on her phone, went viral. I originally found the story here via ABC News. The story was held out as demonstrating the power of one random act of kindness, as in the video posted with ABC’s account. His name is Jeffrey Hillman, and on Sunday night, he was once again wandering the streets — this time on the Upper West Side — with no shoes. The $100 pair of boots that Officer DePrimo had bought for him at a Skechers store on Nov. 14 were nowhere to be seen. Mr. Hillman, 54, was by turns aggrieved, grateful and taken aback by all the attention that had come his way — even as he struggled to figure out what to do about it. He was reluctant to talk about how he ended up on the streets, staring blankly ahead when asked how his life went off course. Since Mr. Hillman’s bare feet became famous, other people reported seeing him without shoes — one even after Officer DePrimo’s gift — and one woman said she had bought him a pair of shoes a year ago. Whatever the case, Mr. Hillman seemed accustomed to walking the pavement shoeless. He was panhandling on Sunday night and carried a cup with a few coins inside. I thought Hillman provided a case study in the difficulty of helping the homeless and destitute. I wondered whether the man who wanted “a piece of the pie” needed treatment that would have been forced on him in less enlightened times, or whether he was helped by those who filled his tin cup. So it now turns out that Jeffrey Hillman, the barefoot beggar who famously received a free pair of boots from a big-hearted police officer, not only has an apartment but pockets as much as several hundred dollars a day while pretending to be homeless. Hillman freely admitted as much to a team of Post reporters who followed him home on the subway Sunday — and then watched as he calmly counted a huge wad of bills. Not to mention that he seems to be the Imelda Marcos of the streets, with at least 30 pairs of shoes and boots. Most New Yorkers will doubtless be disappointed to learn that the inspiring tale of a police officer’s kindness to a man in distress would have such a cynical denouement. Few, however, will be surprised. Even so, there is a moral to this story that is especially timely. The beggar whose charade spurred Officer Larry DePrimo’s act of kindness is a fraud. New York is a generous city, at both the individual and government level. In addition to private charity, those in need can count on a whole raft of services, from shelter to food to rent subsidies and Medicaid. Our guess is that most New Yorkers are more than willing to pay so long as their dollars go to help people truly in distress. Hillman reminds us how easy it is to exploit generosity. His scam seems to have been directed at passers-by who take pity on a man who goes about Midtown pretending to be barefoot, poor and homeless. His example reminds us why it is important for the city to ensure that its own assistance is not exploited by those who don’t need it. For in addition to the needy, New York also has a whole class of politicians and activists quick to denounce City Hall as cruel and heartless (and to sue) whenever it takes reasonable measures to weed out the deserving from the undeserving. When the NYPD’s Larry DePrimo bought those now-famous boots, he represented the best of this city. People such as Jeffrey Hillman remind us that when the greedy take advantage, there’s more cynicism about giving — and less help to go around for those truly in need. I don’t think the Post quite gets the lesson offered by the Hillman saga as a case study. Despite Hillman’s exploitation of the kindness of strangers, I think his case is inherent in the welfare state. One way or another, however, it provides a case study worthy of continuing discussion.